Sojo Studios' Facebook game WeTopia has generated more than $500,000 for children's charities since its launch in November of last year. Now the developer extends its philanthropy-enabling formula to needy animals with Joy Kingdom, a fun free way to turn your social game obsession into happy critters. A lot of people say that Facebook games are just a waste of time. Sojo's Joy Kingdom is anything but. 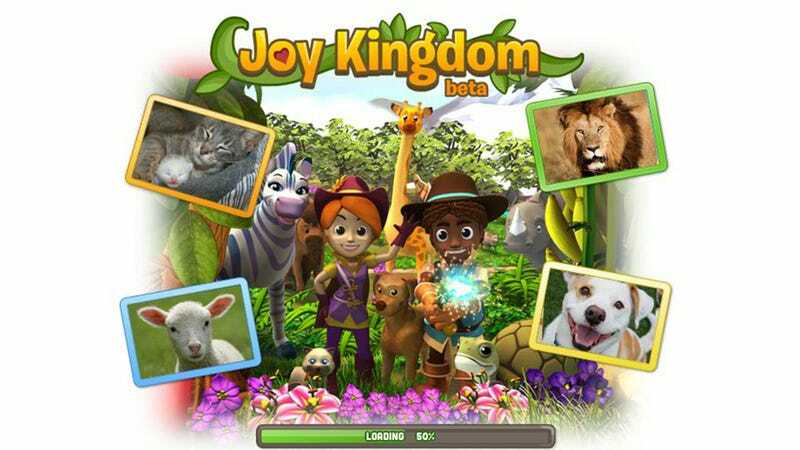 Like countless other farming simulators it involves growing crops and feeding animals, but where other games reward the player with virtual money and goods, Joy Kingdom rewards players with Joy. This Joy can be applied towards projects at various local and global animal rescue organizations and related charities. I lured a squirrel onto my plot this morning, fed it, harvested Joy and then used that joy to provide filtered water for rescued animals. That felt good. If I play for five days straight I provide food for a local shelter. If I play FarmVille 2 for five days in a row I get an inventory full of food I cannot eat. Sojo's formula is pretty simple. Half of the profit from in-game purchases and advertising revenue is applied towards the various charities. Through choices made in game, you decide how your portion of that is distributed. It's simple and elegant. Plus it's got Ellen DeGeneres all excited, according to today's press release. "I've always said I like speaking for animals, because they can't speak for themselves. And now I'm going on Facebook for them, because my cat can never remember her password. Joy Kingdom is fun, and I'm excited about how many animals we're gonna help." I'm kind of excited too.